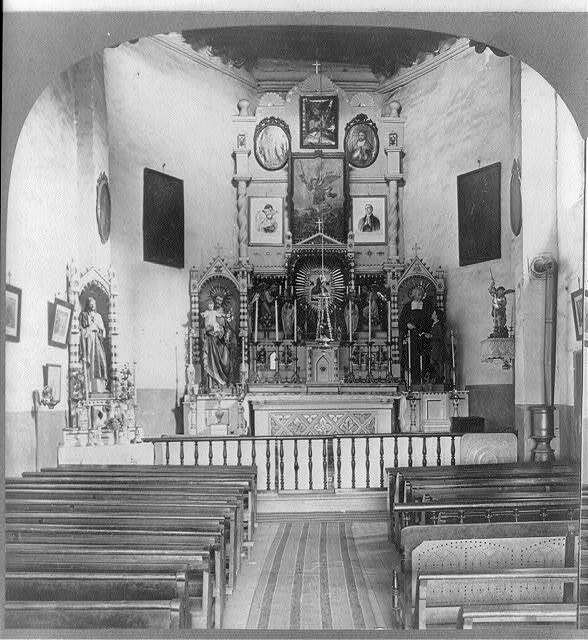 Interior of Oldest Church in United States, Santa Fe, N.M.
Stereograph showing ornate altar and altarpiece of San Miguel Mission with religious figures and candlesticks on the lower level; portraits on the wall above; and Jesus standing on far left. This stereograph card was taken in 1909 and is part of the Stereograph Cards Collection at the Library of Congress. Oldest Church in the United States, Santa Fe, N.M.